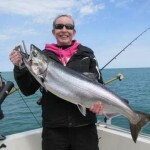 Nice spring king, Chelsea, especially on 8 lb. test leader! 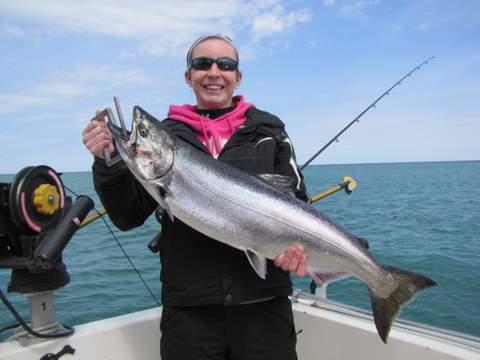 Fishing for browns, lakers, and occasional, cohos, rainbows, kings, and Atlantics has gotten off to a fast start out of Oswego Harbor, with Fish Doctor anglers averaging around 30 fish per trip since our first of the season on April 18. Interestingly, the only forage fish I’ve seen in the limits of trout and salmon I’ve fileted are gobies. That’s right 100$ gobies in trout and salmon stomachs so far. You can bet that alewives will move inshore soon, but right now it’s all about gobies. This little bottom dweller is just that…, a mottled brown forage fish that lives on the bottom, actually walking around on it’s oversized pectoral fins. The furthest it gets off bottom, when startled, is about one foot. To feed on them, trout and salmon have to scrape the bottom, and so should you when you’re trolling right now. 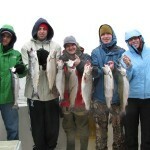 Sure, when browns, kings, cohos, and rainbows are active, they will be on the surface and can be caught there. But…, when their bellies start to fill up and the bite slows down, it’s back to bottom. This time of year aboard the Fish Doctor, we’ll have two riggers scratching the bottom all the time, and some of our biggest fish are taken there, including a 14 lb. king on 4/25/14 taken 25 feet down over 30 feet of water. Although you can buy goby imitation spoons, black and silver spoons seem to work just fine.